LOL, 02 Dec 2018I don't see why you're so upset and abuse other people. Sony'... moreMisunderstanding my opinion?! See, proving that here (must get a life dudes) are nullities wanting to brave themselves. Copy paste manipulated statistics?! Real life proof is the matter I was talking about. Do you have at least one perfectly used Xperia? Don't care? So long (me LOL now) nullity! Syuser, 30 Nov 2018Very well said! My M, Z3c tablet, absolutely as in first day qua... moreI don't see why you're so upset and abuse other people. Sony's mobile division is losing a lot of money. 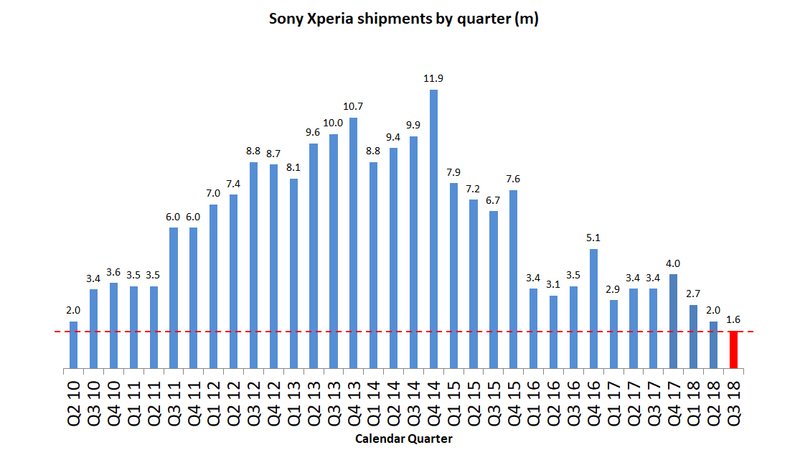 Sales of Xperia phones are at a record low. XZ4 will cause Sony Mobile to lose even more money, because Sony still does not understand the market. Anonymous, 30 Nov 2018I am a Sony user until right now and my Sony phone was still goo... moreVery well said! My M, Z3c tablet, absolutely as in first day quality. And these nullities still dare to comment in regards of Sony GSMa threads about useless Sh(eat)sung groceries that now are great industry. All my SS's from video cassette players when I was at 5 y.o., untill now, to laptops, HDD's, and memory chips were thrown long time ago at GARBAGE! Oh Lord, my Sony video cassette player is still working... What are we talking about? Same(sh-eat)sung? GET A LIFE PEOPLE! Volume buttons, fingerprint & power button, camera button. What is that third button between the fingerprint and camera button for? imparanoic, 30 Nov 2018While this year xperia 'ambient flow 'is similar to Samsung desi... moreSo, it is not copy of current Samsung Galaxy phones, but is successor of ancient 2013 design? Maybe you also will blame Samsung that they are copying SONY design? I'm SONY user, still with my XZP, but this mobile division of SONY is hilarious! I'm 90% sure that my next phone will not be SONY one. And company sales numbers confirm my opinion. Most of SONY users left the ship. If the company doesn't make changes in management in mobile division it will bankrupt soon. Not the whole company - just the mobile division. Impressive tech design SONY... keep it up! Anonymous, 29 Nov 2018Even though they still provide most phones with its sensors.. an... moreYes. Thats why they dont really need their mobile division. Syuser, 29 Nov 2018Without any doubt! My family and some friends have more than 3 y... moreLess and less people buy xperia every year. Now with this "galaxy clone" design, people will avoid it even more. Most people will think "Why should we buy fake galaxy if we can afford to buy the original galaxy"
JohnJbon, 29 Nov 2018Sony will definitely Back On Track.Love This New Design..10 Thumb UpWithout any doubt! My family and some friends have more than 3 years old Xperia devices that are still so good at using. Sony it's a true and never-ending legend! [deleted post]Even though they still provide most phones with its sensors.. and itÂ’s only business that is not doing so well is the mobile division of thereÂ’s..
Too tall. Must be uncomfortable. 21:9 is only good for foldable phone. Anonymous, 28 Nov 2018RIP Sony, you wont be missed~ Never learned from their mistakes.....Funny how everyone has been saying 'RIP Sony' for 3 years now, but... Somehow they're not dead.